This brand new book is a lot of fun, and the photos are stunning. It has more about okra than you knew you “Wanted to Know”. Oil from the seeds, eating the leaves, okra-stem drinking straws, okra seed tempeh, okra marshmallow delights, okra history and geography, medical and industrial uses and so much more. It contains growing tips and recipes, but is not limited to the practical realm. 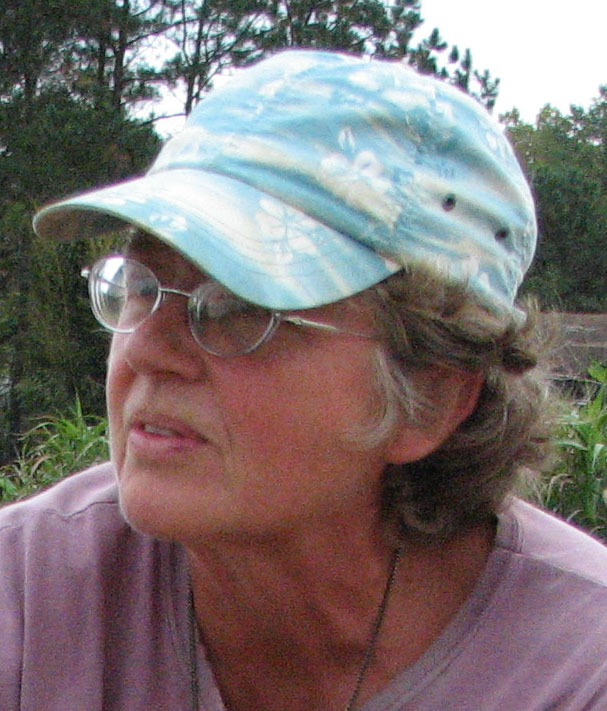 Chris Smith lives in North Carolina and works with Sow True Seeds in Asheville. He is also a writer, speaker and consultant. He is an immigrant farmer, like me, coming from a climate where okra does not grow. “As a white British guy, I am fully aware that okra is not part of my culture or heritage. I have, however, fallen in love with okra and have tried to approach this book with integrity, and a deep appreciation of people and food.” Fortunately for us all, he persisted beyond his encounter with soggy, slimy, greasy fried okra to discover much better ways to use this versatile vegetable. Chris has grown 76 varieties of okra, cooked it in many different recipes, and experimented on himself and his family with “beauty” preparations and alcoholic tinctures and beverages. He is growing another 76 different varieties in 2019. The USDA Germplasm Resources Information Network (GRIN) holds 1099 separate accessions from all over the world. India grows the most okra, by far (over 6 million tons in 2014). Nigeria is second with 2 million tons. The US is 21st in line (producing 10,000 tons in 2014). The US also imports 50,000 tons mostly from Mexico and Central America. 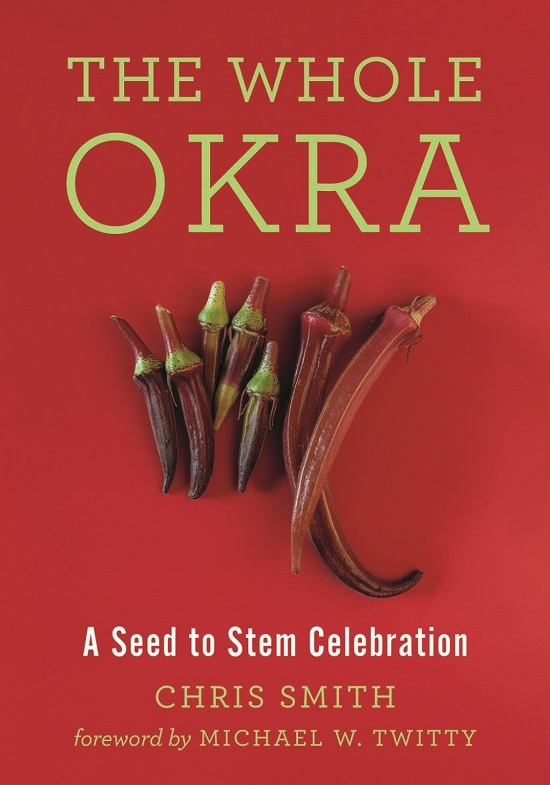 In his introduction, Chris says: “Not embracing okra because it’s slimy is like not visiting the Alps because you’re scared of heights.” Okra is often dismissed these days as a vegetable people don’t like, although it used to be a favorite of many. In the 1900s, the Tabasco brand of canned okra sold well. 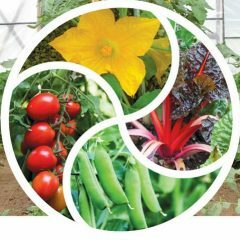 We need resilient crops in the face of climate change; we need to grow more of our own food, eat locally, organic, and with less or no meat, to survive the uncertainties ahead. Zero food waste has become a goal of some chefs (and no doubt, some home cooks too). 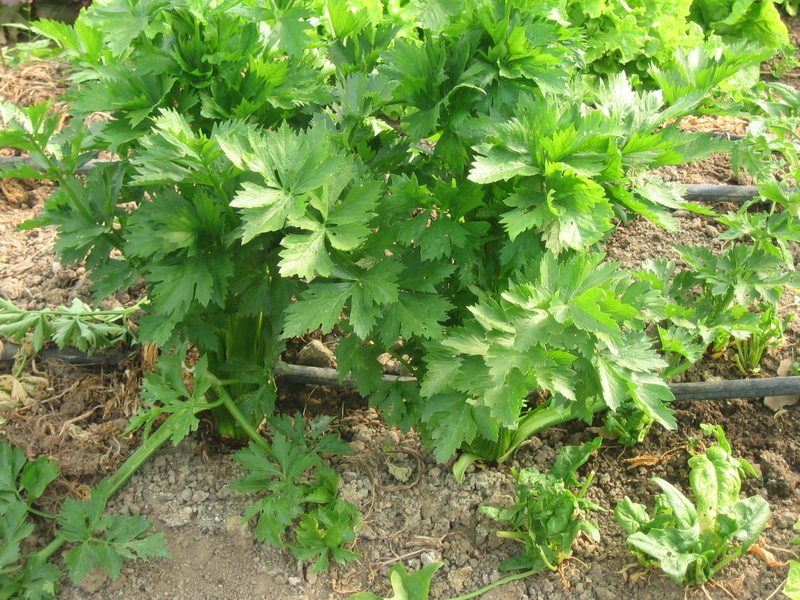 The Whole Okra provides help with several steps on this journey. Early in the book, Chris embraces the S-word (slime), including some great photos of his smiling family with okra slime face masks and okra-slice eye pads, and himself with okra mucilage hair conditioner. Although Chris is only recommending things he’s tried himself, he does mention some untested ideas, like substituting okra juice for mallow juice as a tonic. A (tested) recipe for okra marshmallow delights is included. Adding acidic ingredients (think tomatoes, lemon juice) to a recipe will effectively cut through the sliminess. 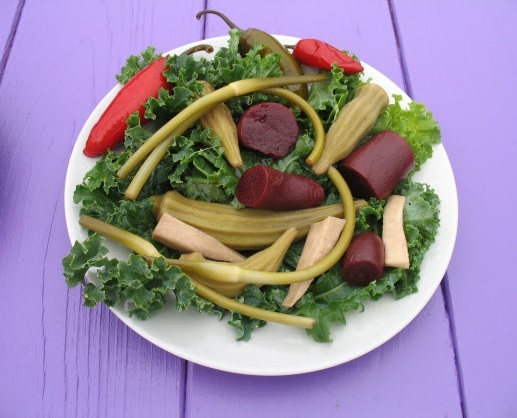 Pickled garlic scapes, okra and beets. 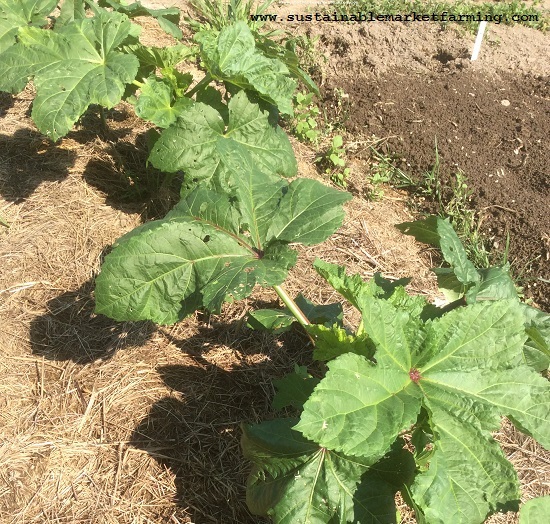 If you have grown okra, you will probably be familiar with the sudden glut that arrives at some (hot) point in the summer. Here are instructions for freezing okra, pickling (both by fermenting and with vinegar), drying (best when strung on dental floss). Best of all are the okra chips (season 2 pounds (907 g) of pods with oil, salt, spices, roast at 500F (260C) for 20 mins, then 170F (75C) for 2-3 hours). 4 ounces (113 g) of tasty crunchy chips! Who knew? There’s also info on pressure canning, and okra kimchi, which can be dried, powdered and used as a seasoning. Close up of Cow Horn okra pods. Okra can be self-pollinating, but produces more seeds per pod when pollinated by insects. There is a specialized native okra bee, Ptilothrix bombiformis. Okra is not native to North America, but rose-mallow and hibiscus are. The flowers are edible cooked, but of course you won’t get an okra pod if you’ve eaten the flower. 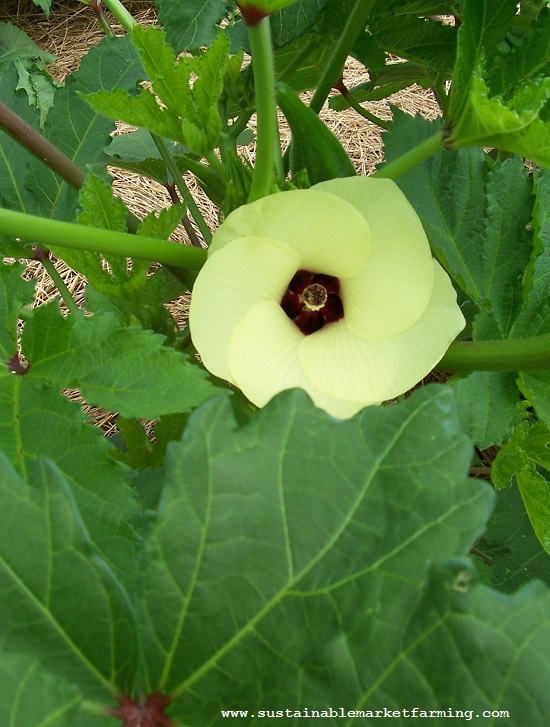 Unlike squash, okra does not have separate female and male flowers. Flowers can be dried, used in tea blends, or in vodka for tinctures and nightcaps. Only eat flowers if you have an over-abundance of pods or you are about to go away for a long weekend and don’t want to come home to a mass of woody pods. Believe it or not, Chris has uses for woody pods too! These can often be obtained free or cheap in high summer. Don some gloves. 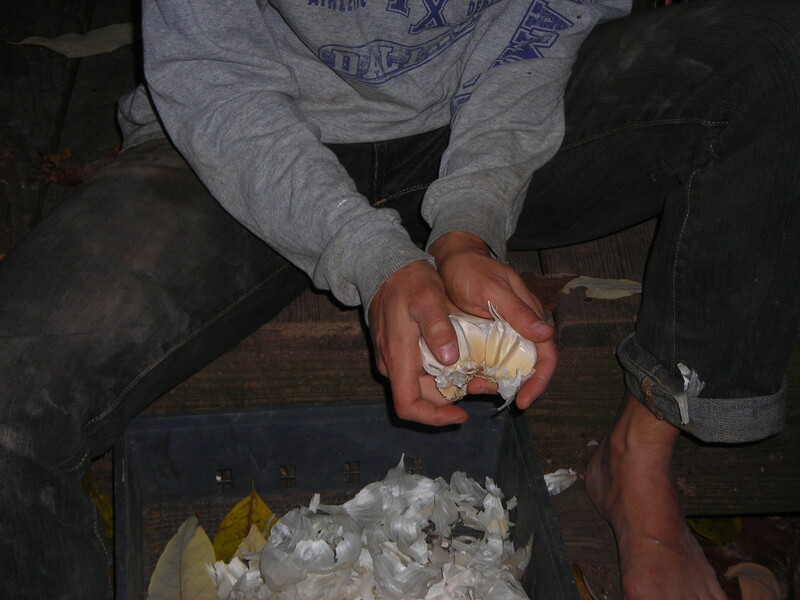 Open the pods and shell out the immature seeds, which can be cooked and eaten then, or blanched and frozen for winter. Thoroughly dry the empty pods, then powder them, and sift through a fine mesh. The pod powder can be used as a thickening agent in place of cornstarch. 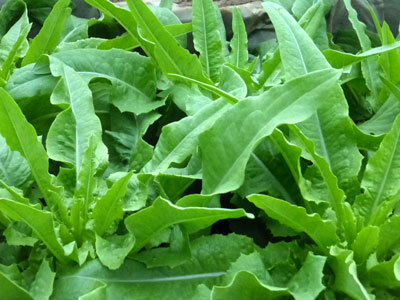 The young leaves make appetizing summer greens and are higher in protein than the pods. They are used (mixed with yam and other vegetables) by the Igbo people of Nigeria. 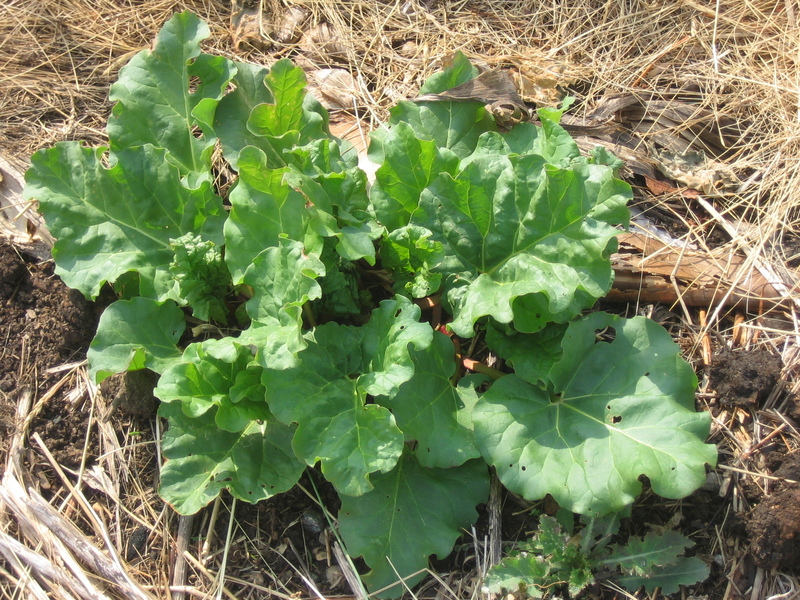 Choose very young leaves, or fairly young leaves of a variety without spiny leaves. Heavy Hitter is the variety to grow for large supple spineless leaves. 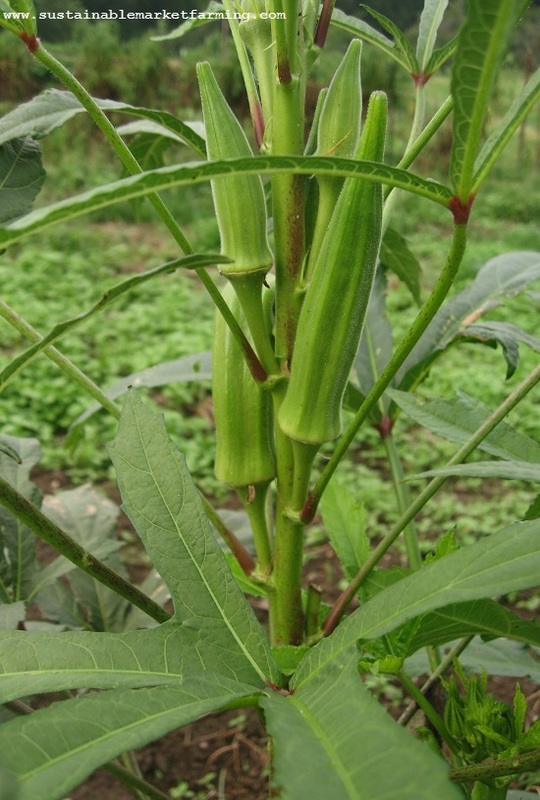 A close cousin of okra, abika, is used as an important leafy green in some Pacific Island nations. Seeds can be bought from Monticello, under the name Sunset Hibiscus. Deep-fried young leaves can make crisp chips, like kale chips, but different. 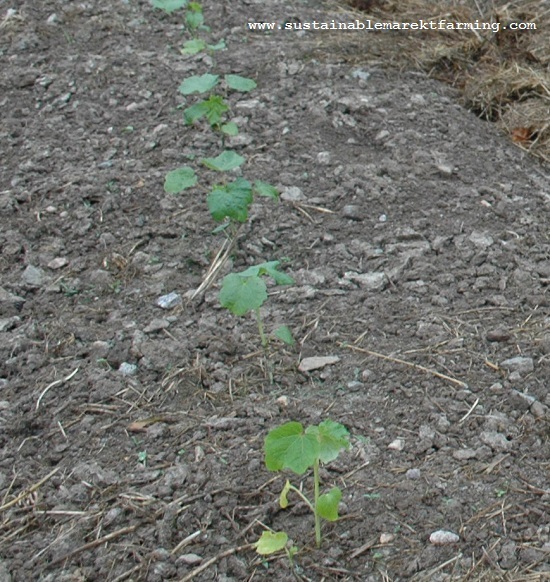 If you are saving okra seed, you will often have more seeds than you need to grow, you can sow those for microgreens. Chris has a small aquaponics system made from a barrel. Goldfish (and tilapia in summer) are in the bottom section of the barrel and the water is pumped to the top section which grows the microgreens. 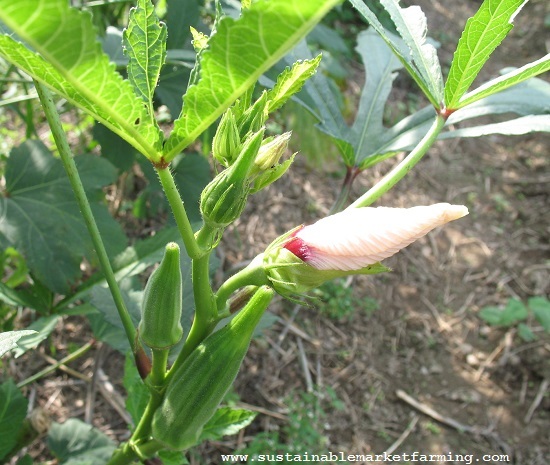 Mature okra seed has a tough hull and a nutritious kernel which can be ground into flour and used in soups, sauces, gravies, and okra seed tofu and tempeh. Back to woody pods: they can make Christmas tree ornaments, earrings, strings of holiday lights (hint: cool LED bulbs, not fire-prone hot bulbs), and painted ornamental figurines. Crushed pods can be used to grow mushrooms. I’m waiting to find out if Chris suggests using them as mulch, or as firelighters. (My Advance Readers’ Copy doesn’t have an index). Cow Horn okra pods and flower. It was known in 1874 and in 1919 that oil can be extracted from okra seeds, but forgotten since. Chris describes hand-cranking his Piteba oil press, for small yields of delicious yellow-green oil. In a comparison of okra oil with that from sunflowers, safflower, soy and sesame [why only the oils that start with S?] 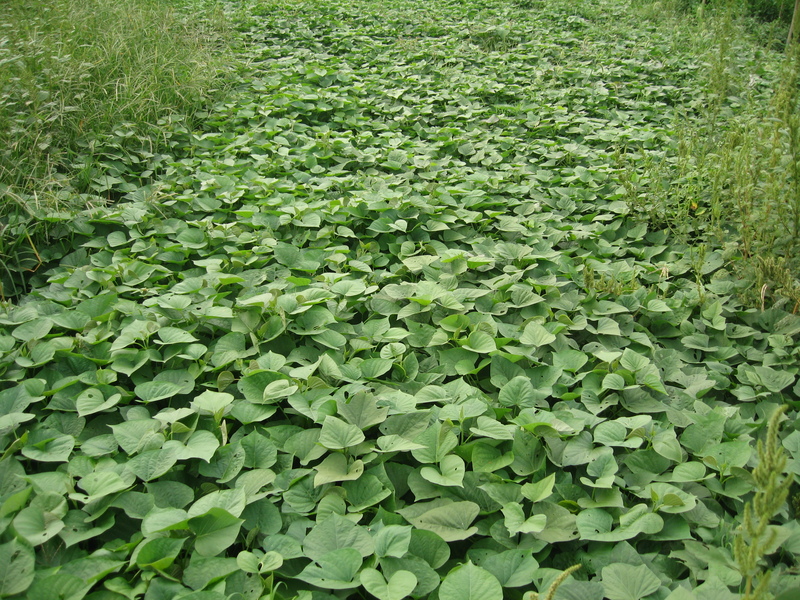 the yield of okra oil per hectare is second only to sunflower. The yield pf protein is the highest, beating soy. Clay Oliver makes artisanal small-batch oils, including okra. In a study by Robert Jarret, the oil content varied by variety from 9.19% to 21.56%. Okra seed flour has high levels of protein and fat, and an impressive range of amino acids. It can be made into bread and other baked goods, mixed with cornmeal. Okra seed was used as a coffee substitute during the civil war. Chris tries everything, and reports that the roasted seeds, when ground, release an appetizing coffee aroma, and look just like coffee, but the beverage tastes nothing like coffee (and has no caffeine). So much for that! 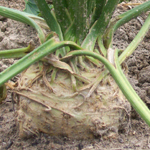 Okra stalk fiber is next – you can make cordage or crochet a hat. Okra is related to jute, kenaf, roselle, kapok and even cotton. Paper is another option. Okra paper is beautiful, strong, and you can make your own paper or twine, following Chris’s instructions. It never caught on commercially, because supply could not meet demand. Okra seedlings in a Winstrip tray in the greenhouse. 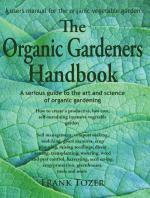 Naturally enough, there is a chapter on growing okra. 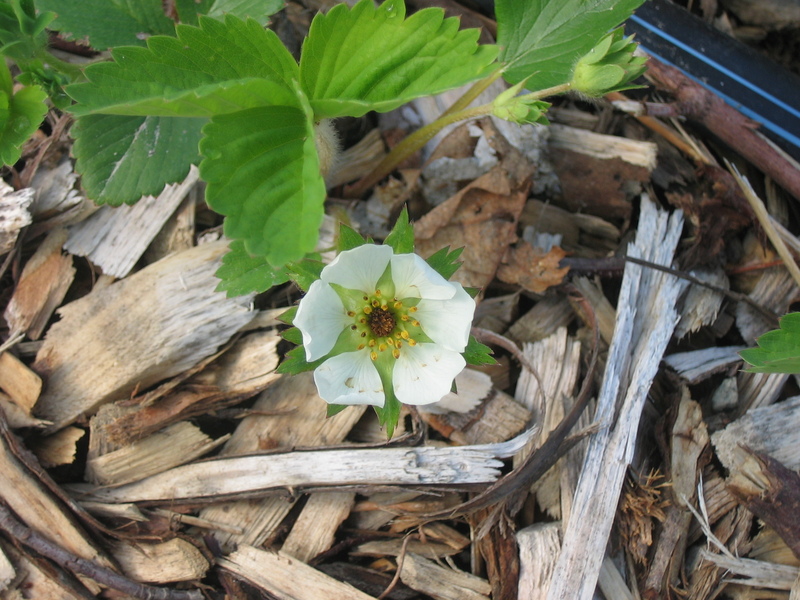 I was amazed to learn that at about 3 weeks of age the 6″ (15 cm) tall plant could have a taproot three times as long! At full maturity, the tap root could be 4½ ft (1.4 m). This suggests okra would be sturdier if direct sown, rather than transplanted, but you work with the climate you’ve got! 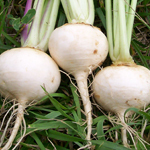 To avoid stunting the taproot, get the small plants in the ground as soon as you can. But it needs to be warm enough. Bruce Adams at Furman University suggests waiting until the butterflies migrate from the South. Here’s the info you need to get your seed germinated: Warmth, soaking the seed for 8 hours in water at 88F (31C). Get the book for all the details. 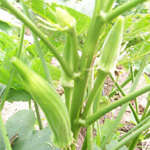 There are several false rural myths out there about growing okra. Okra has naturalized in the Red River floodplain in Louisiana, and also near Durham, North Carolina, where it survived some freezing temperatures. 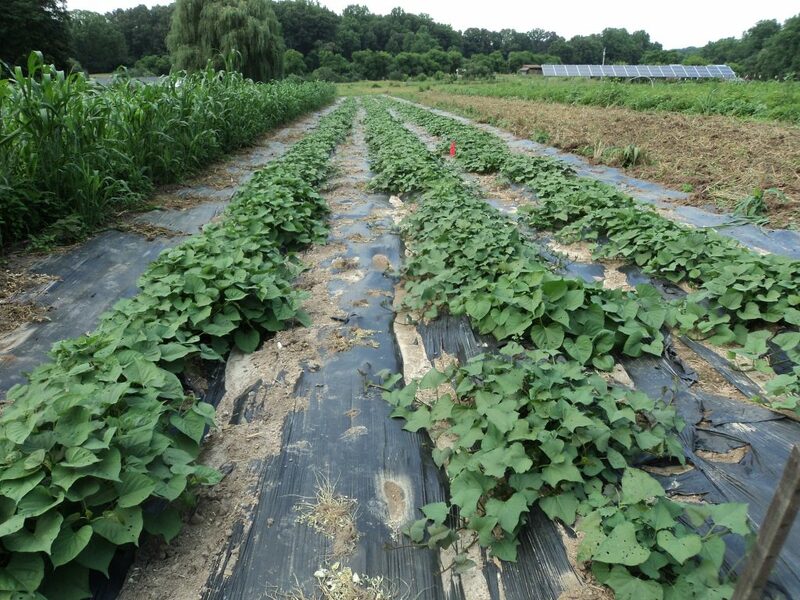 Our mulched Cow Horn okra plants in June. Recommendations on spacing vary a lot: as close as 6″ (15 cm) in rich soil, to 24″ (60 cm) for some of the bigger varieties elsewhere. Wider spacing leads to more branches and more pods per plant, but not necessarily more pods for a given area. And the important matter of deciding when a pod is mature but not too fibrous receives good attention, and a helpful photo, although Chris does warn that it’s best to develop a feel for the rigidity of tough pods. You can’t tell just by length, even within a variety you know well, as the weather will change the size of a mature pod. Chris recommends snapping the end off a trial pod. A clean snap indicates a good meal ahead. A pod that doesn’t snap or that “splinters” is too woody. Three to nine days after flowering is how long it takes to mature a pod (and 40 days from flowering to mature seed). 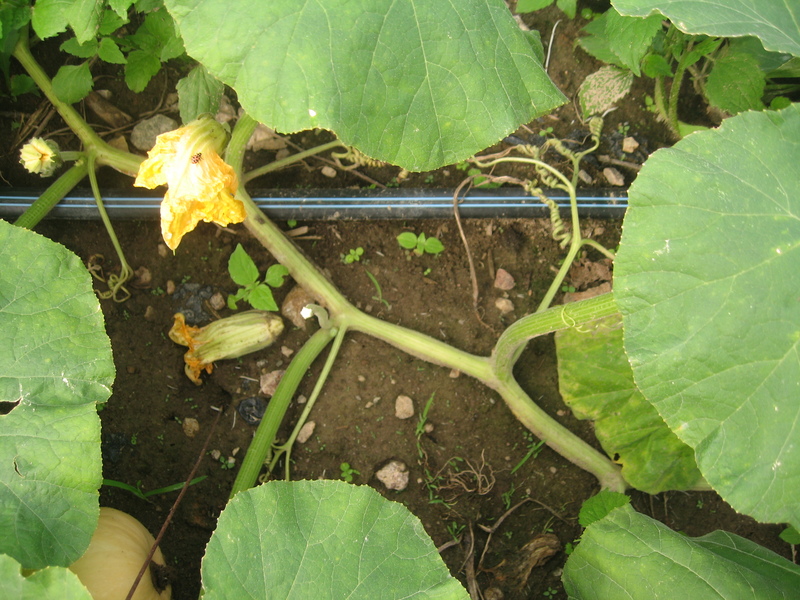 An experienced grower suggests harvesting 4 days after flowering, regardless of length. In drought it might be 2″ (5 cm) long, in warm rainy weather 6-7″ (15-18 cm) Chris includes a hilarious description comparing reactions of Americans and British family and friends being served tough okra. As a fellow Brit, I laughed aloud. Buy the book, I won’t spoil the suspense! Store the unwashed pods in a cool damp place after removing the field heat.. I was intrigued at the description of Zero Energy Cool Chambers (ZECC) in India, but wonder which part of India, and if this would work in a humid climate. 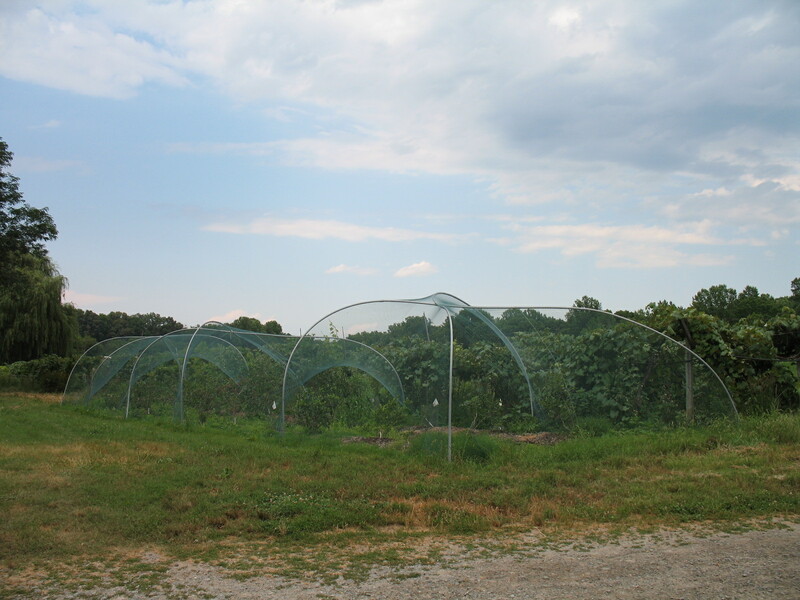 Zero energy cool chamber from GARIMA T.
The back of the book includes a summary of Chris’s 2018 variety trial and includes descriptions his observations, including pod spininess, branching and productivity. And to end this review, no, Chris did not mention what great kindling dried okra pods make, nor what great long-lasting, weed-free mulch they provide. 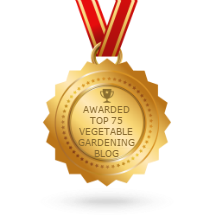 (I recognize you need to grow a lot of okra seed to produce enough mulch to write about!) Thanks Chris! An entertaining read, and lots of practical information, and inspiring photos! Hoophouse covered! Frost expected Sunday and Monday nights! Well, after two weeks exposed to the elements, our hoophouse finally got its renovations finished, and we put the new plastic on this morning. I haven’t yet got the photos to prove it, but take my word for it, the stress is over! Two people are out there right now, finishing inserting the wiggle-wire in the channels round the edges, and trimming off the spare plastic. We’d all forgotten how hot it gets in there with plastic on! Suddenly no-one wanted to go inside. This morning’s work went smoothly till we got to the second layer of plastic. Last night was cool and dewy, and the grass wet. 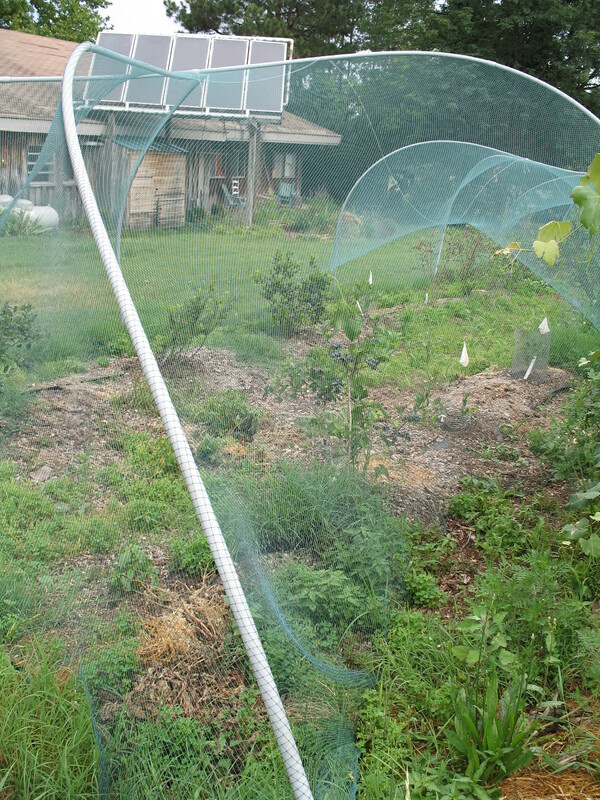 As we pulled the second layer of plastic up and over the hoophouse, it got a film of dew on the underside – bad planning! The top layer than stuck to the bottom layer and was really hard to pull over. We turned on the blower to try to push some air between the layers, and we also wafted it ourselves. Eventually we were successful, but we did make a few holes in the edge of the plastic in the meantime. Those who’ve never put plastic on a hoophouse might wonder how it’s done. Here’s our method: we tied ropes (thank you Twin Oaks Hammocks) around tennis balls pushed up in the edge of the plastic, like little Halloween ghosts. We used five along the 100′ length of plastic. Then we put more tennis balls inside colorful odd socks (thank you Twin Oaks Community Clothes) and tied the other end of each rope to one of these. Someone then threw the balls-in-socks over the top of the hoophouse to the far side. Hilarity at how many of us never learned to throw well! The first layer slid on quite easily, and we “tacked” it into position every ten feet or so with a piece of wiggle-wire. Then we repeated the ball-in-sock throwing exercise with the outer layer. That’s when it got difficult. And our bag of chocolate chips had to be moved to the shade because they were starting to melt! After we got both layers of plastic in position, we pulled out the slack and fastened the wiggle-wires fully in the channels. The shiny new plastic looks beautiful in a techno-sparkly kind of way. And it promises to help us grow tons of delicious food for the winter. Thank goodness it’s done.The weather forecast suggests we’ll have frost on Sunday and Monday nights. 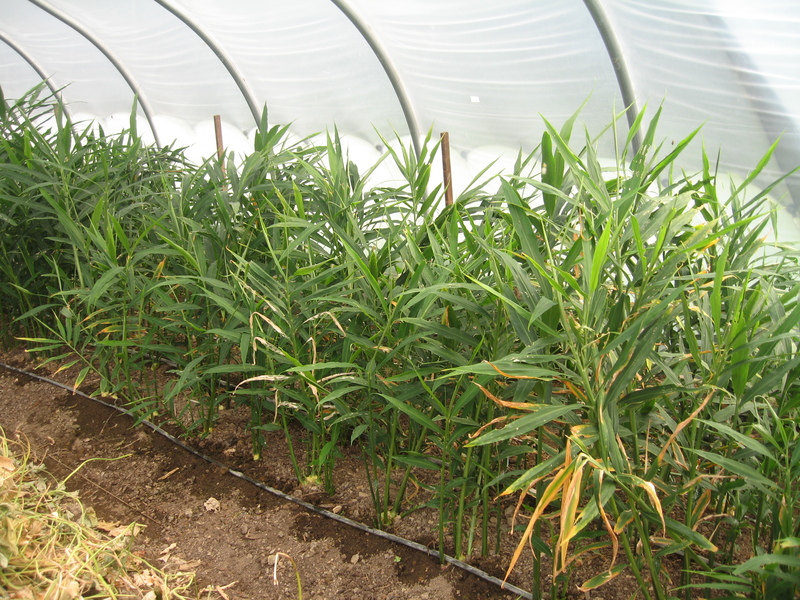 We’ve got ginger and cowpeas growing in there – we don’t want them frosted. Ginger growing in our hoophouse. 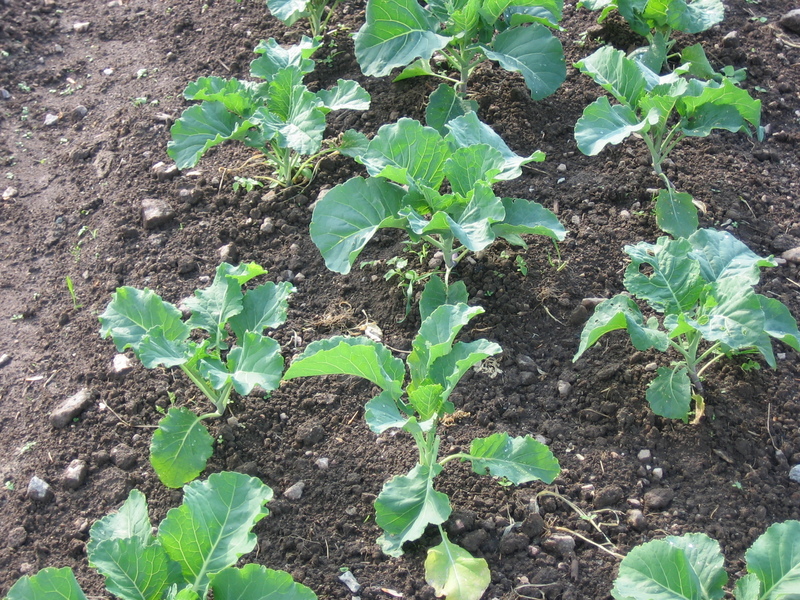 The Asian greens, spinach and radishes can take it, but not the warm weather crops. We’ll still have some odds and ends to finish up: one of the windows needs a repair to the frame, and the bubblefoil stuff along the north wall needs tacking back into place. All in all, though, a happy conclusion to this project. 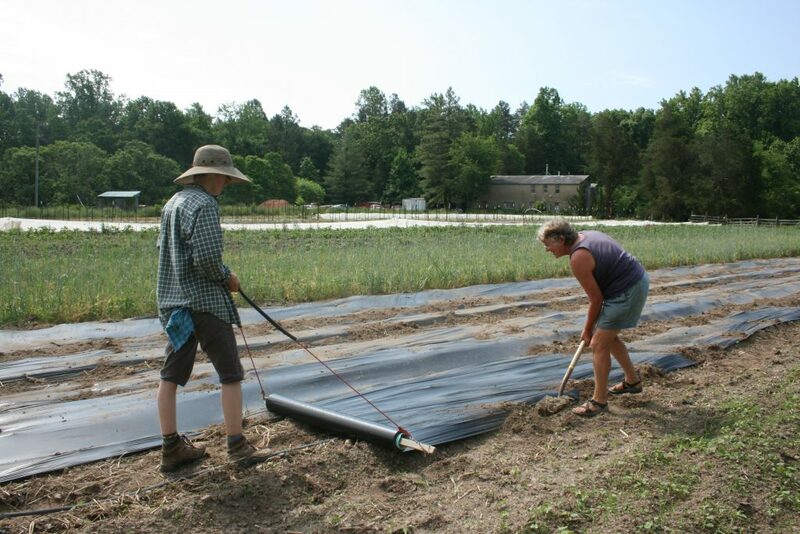 Outdoors, we are bringing out rowcovers to cover late plantings of squash, cucumbers, green beans, lettuce. 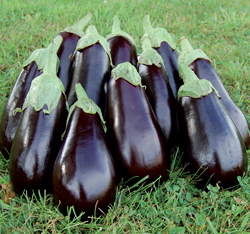 It’s goodbye to the eggplant, okra, sweet corn, tomatoes. It’s time to harvest the sweet potatoes and peanuts. Maybe it’s goodbye to galinsoga and other tender weeds. Maybe goodbye to harlequin bugs. The brown marmorated stink bugs are starting to seek shelter for the winter, in our sweatshirts hanging on the shed door. Goodbye to all that. And hello to sweet potatoes, boiled peanuts (a seasonal tradition here), kale, spinach and leeks. 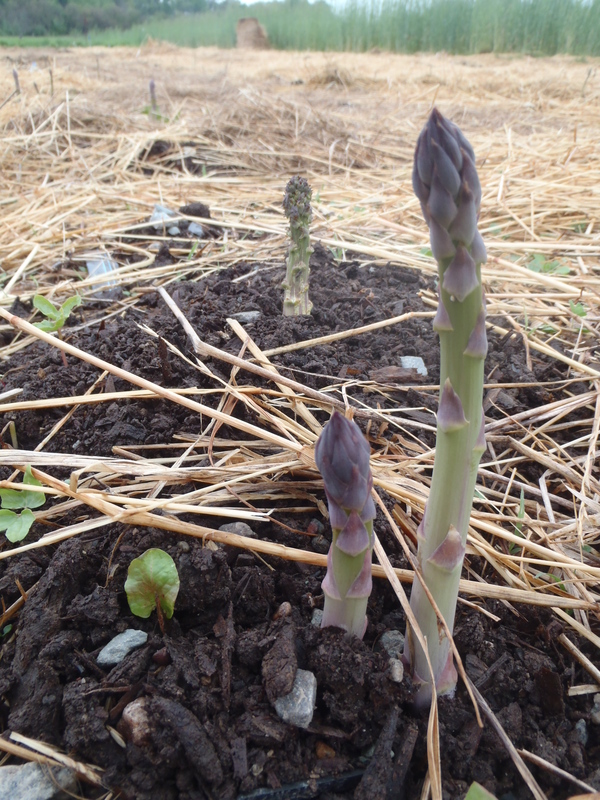 We grow asparagus beans (yard-long beans) to add variety to stir-fries, not as a major crop. To me, the flavor is not as good as bush green beans, but the shape and color, and the easy-care nature of this crop make them worthwhile. 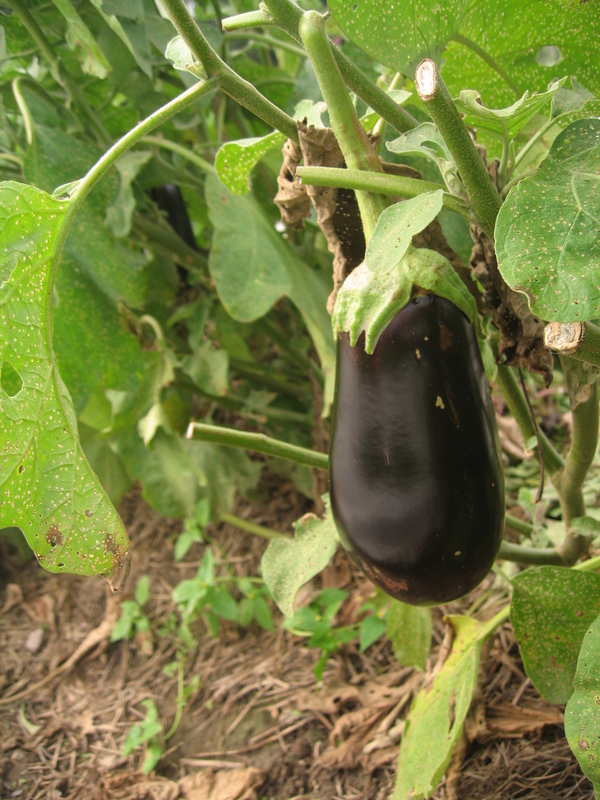 We grow Chinese Red Noodle or Purple Podded, which both keep their color when cooked. We harvest them at pencil-thickness, not at the yard-long puffy and stringy stage. Cut into one inch lengths, they brighten up any dish of mixed vegetables. Once the tall trellis is in place, this crop needs little work. 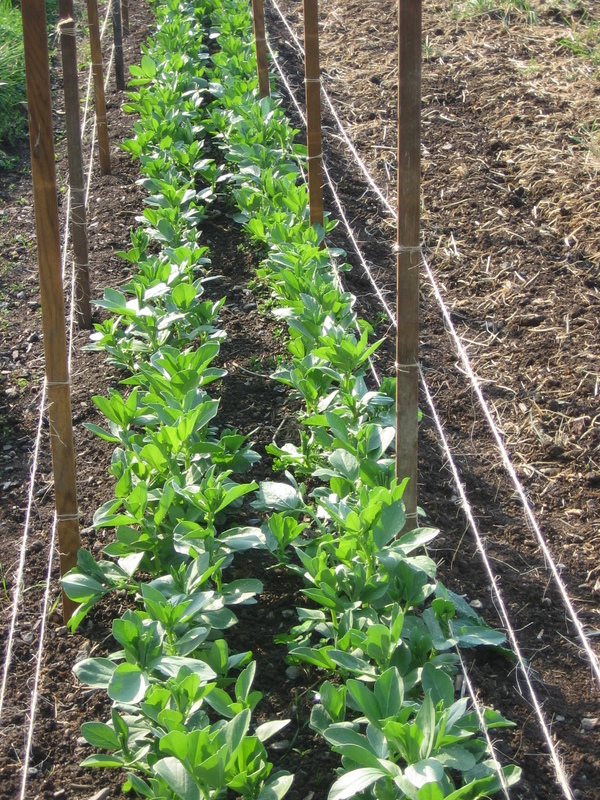 They like the heat and are fairly drought-tolerant – they are more closely related to southern peas (cowpeas) than to green beans. They are not much troubled by Mexican bean beetles, and they’ll go on producing beans until the frost. Normally we’d start picking sweet corn about now, but this year our first sowing suffered in the unusual early hot dry weather of our spring. We even plan for some degree of failure with our first sowing, because we do sow it early, which is always risky. 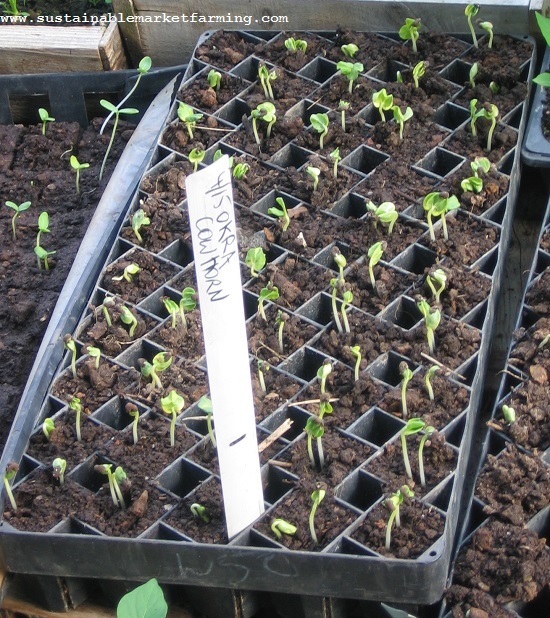 We sow some seeds in Styrofoam Speedling flats on the same day we make our first outdoor sowing. The Styrofoam flats float in a water tank, needling little attention from us. 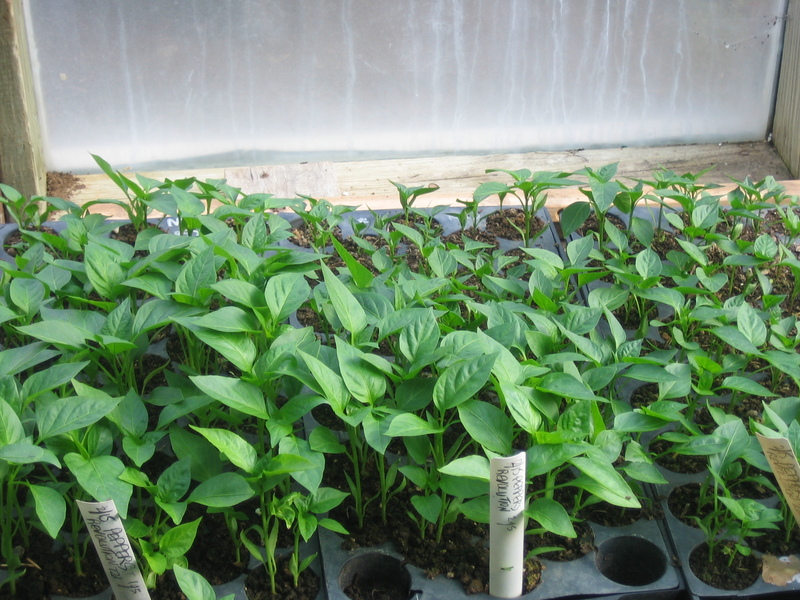 Our plan is to use the seedlings at 2-3″ tall, to fill gaps in the rows. This year even this plan B didn’t work out. We were very busy and the seedlings got too big for successful transplanting. So we have very little early corn this year, sigh. Next up, any day now, will be our first harvest of edamame. 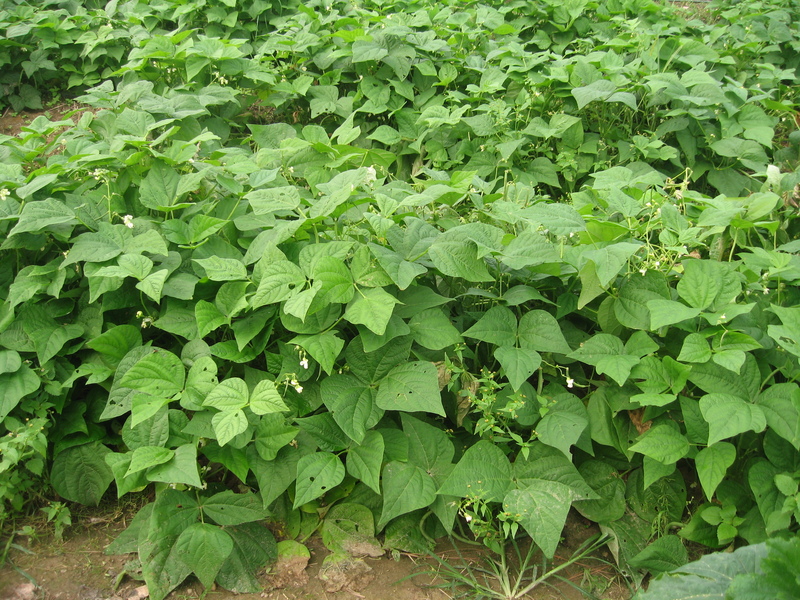 This is a kind of soy, which can be eaten fresh. 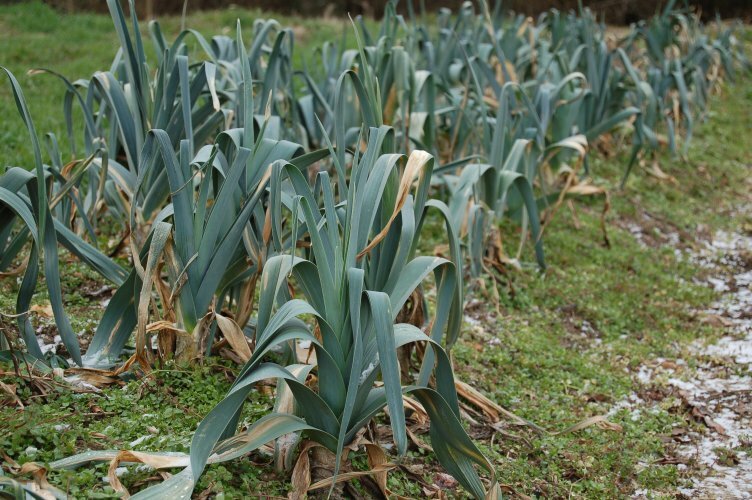 We like Envy, a fast-maturing kind on short plants. We pull them up and strip the pods as soon as they are a bright green, moving towards gold, and the beans are a good size inside the pods. 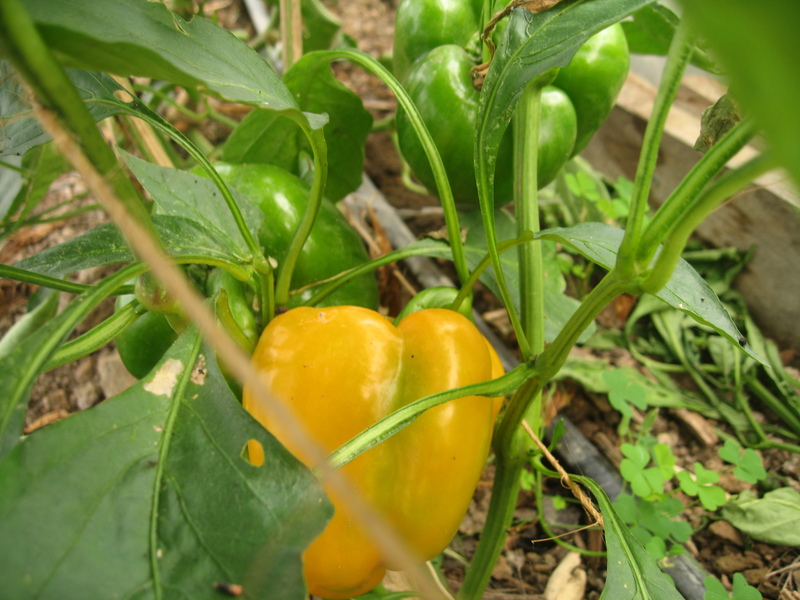 Some gardeners prefer a taller variety, and harvest several times from the same plants. We tried this, but found we prefer the once-over harvest. 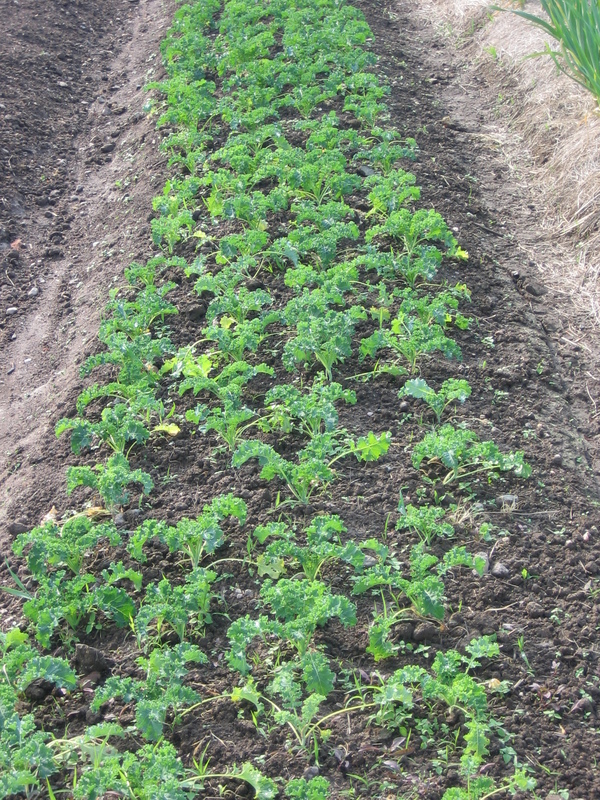 We make a succession of five or six sowings, to provide a new harvest every few weeks until frost.